At least 4 women have accused Battali of groping them. ABC's "The Chew" has terminated its relationship with famed chef Mario Batali, days after the blog Eater published a report featuring four women who alleged sexual misconduct against him. "Upon completing its review into the allegations made against Mario Batali, ABC has terminated its relationship with him and he will no longer appear on 'The Chew,'" a network spokesperson told ABC News. "While we remain unaware of any type of inappropriate behavior involving him and anyone affiliated with our show, ABC takes matters like this very seriously as we are committed to a safe work environment and his past behavior violates our standards of conduct." A request for comment from Batali was not immediately returned to ABC News. 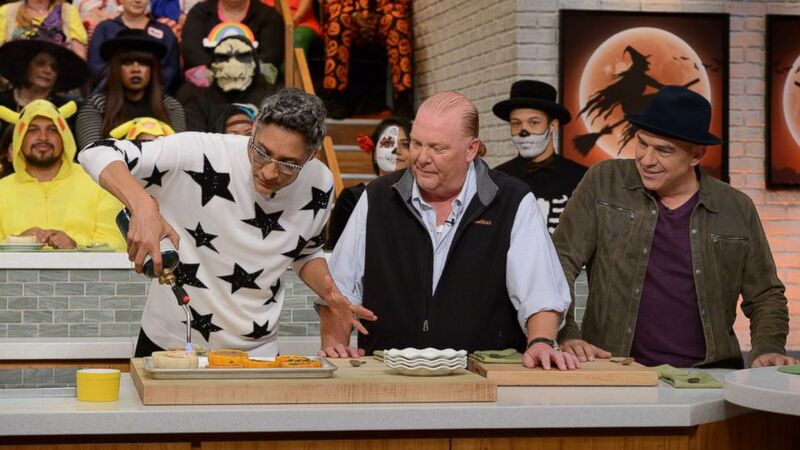 (Lorenzo Bevilaqua/ABC via Getty Images, FILE) Carla Hall, Mario Batali, and Michael Symon shown on "The Chews Halloween Bash" which aired on October 31, 2017on ABC. Batali was asked to step away from the show on Monday while the network reviewed "the allegations that have just recently come to our attention," a spokesperson said at the time. Batali also stepped away from his restaurant empire following the allegations. Eater reported that at least four women have accused Battali of groping them over a span of almost 20 years, noting that he was "reprimanded for inappropriate behavior in the workplace as recently as two months ago" by Batali & Bastianich Hospitality Group, the company he co-owns with restaurateur Joe Bastianich. At the time of the report, a spokesman for the Batali and Bastianich Hospitality Group told ABC News in a statement, "Mr. Batali and we have agreed that he will step away from the company's operations, including the restaurants, and he has already done so." The formal complaint that triggered the reprimand was reportedly the first one to officially emerge from an employee. Eater said Batali was forced to undergo training. Batali himself also released a statement earlier this week that said he was leaving his company for an unspecified period of time, "to try to regain the trust of those I have hurt and disappointed." His statement reads, in part, "I apologize to the people I have mistreated and hurt...much of the behavior described does, in fact, match up with ways I have acted. That behavior was wrong and there are no excuses. I take full responsibility and am deeply sorry for any pain, humiliation or discomfort I have caused to my peers, employees, customers, friends and family."